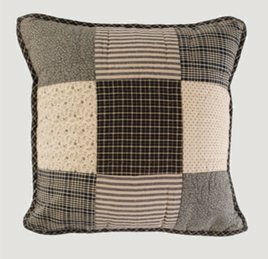 The rich colors of the Kettle Grove Quilted Pillow has a pattern with random 5" blocks in woven plaids, woven stripes, & prints. Select from our coordinating pieces including: quilts, bedding accessories, window treatments, & kitchen coordinates. 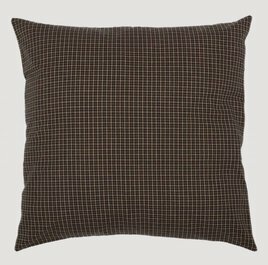 Kettle Grove Fabric Euro Sham 26"x26"
This Kettle Grove Fabric Euro Sham features woven black plaid cotton. Coordinates with the Kettle Grove Collections of bedding & curtains. Measures 26" x 26" square with a knife-edge finish. The back features a 3" overlap and three buttons. 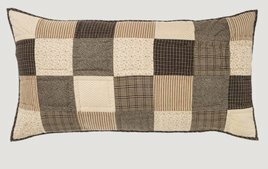 Kettle Grove Quilted Euro Sham 26"x26"
The Kettle Grove Euro Sham with woven plaids, stripes & prints measures 26" x 26" and features a random patchwork block pattern. 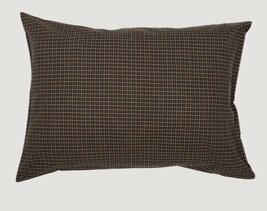 Made of 100% cotton shell and fill, The backing has a 3" overlap with 3-button closure to conceal pillow insert. The Kettle Grove Crow Pillow makes a classic statement on any bed or chair. Available in two sizes, 16" x 16" or 10" x 10". Made of 100% cotton. This pillow is machine washable. Sold Filled. The Kettle Grove Sham features random patchwork block pattern on the front. The shell and fill are 100% cotton with woven plaids, woven stripes & prints. Machine pieced and hand-quilted. Backing has a 3" overlap with a 3-button closure. The Kettle Grove Star Pillow makes a traditional statement on any bed or chair. Available in two sizes, 16" x 16" or 10" x 10". Made of 100% cotton. 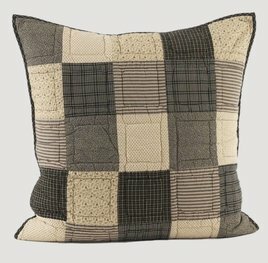 This pillow is machine washable. Sold Filled.